Halsey's new video is one big homage to Baz Luhrmann's iconic 1996 movie. Halsey's long-awaited lead single from her as yet unreleased album, Hopeless Fountain Kingdom finally dropped last night and promptly set the internet on fire. 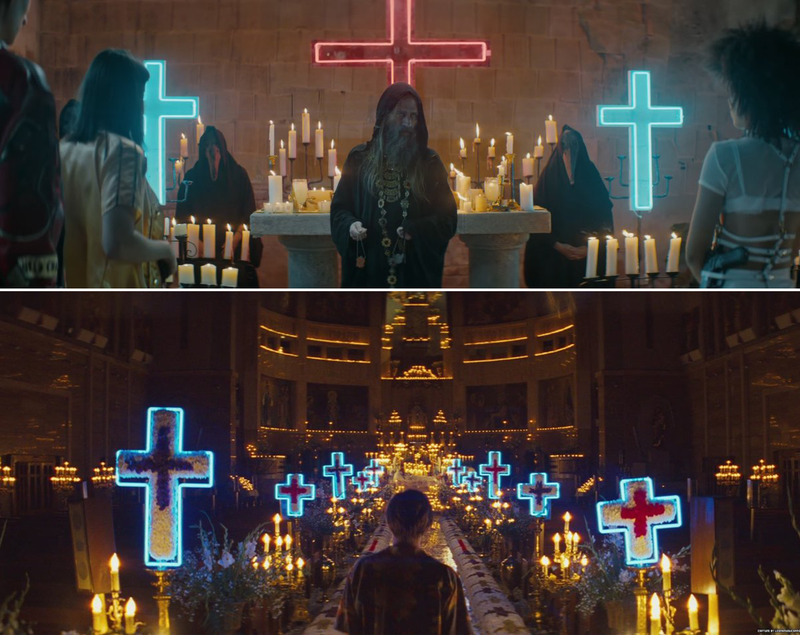 'Now or Never' was released accompanied by a mini-movie music video and people couldn't help but notice the influence and similarities between it and Baz Luhrmann's iconic 1996 film, Romeo + Juliet. 1) The neon crosses at the altar of the church. Who could forget those iconic neon cross lights? 2) The detailing on the guns. The Aureum and the Angelus' guns have pretty similar detailing to the personalised ones used by the Montagues and the Capulets. Don't know if you know this but Leo DiCaprio actually invented Hawaiian print shirts in 1996 when 'Romeo + Juliet' was released. Halsey and the rest of the Aureum family wear them through the video. 4) The star-cross'd lovers in bed. What's your OTP? Romeo and Juliet or Luna and Solis? 5) The symbolism of the family crests. The family crests play a big part in identification; in 'Now or Never' family members are identified by their necklaces, and in Romeo + Juliet, the crests can be found on their guns. 6) The interiors of the Angelus/Capulet mansions. Nothing says "we're throwing a glamorous house gathering" like red drapes. 7) The Friar-esque character who tries to mediate between the waring families. In the 1996 film, Friar Laurence works to help Romeo and Juliet escape Verona and be together. In 'Now or Never', he calls up the members of the families to work together to help the lovers. 8) The crumbling worn-down city. Ok but would you rather live in Baz Luhrmann's Verona or Halsey's Hopeless Fountain Kingdom? 9) And of course, the angel wings.